What Light Bulb Saves the Most Money? When figuring out your household budget and looking for ways to cut costs, lowering energy consumption is a great place to start. We make it a point to turn the lights off when we leave the room, we may upgrade to Energy Star appliances and then hope to see a drop in our monthly bill. But a simple way to cut energy costs in your home or office that is often overlooked is updating your light bulbs. We now have several options when it comes to types of bulbs available. Different bulbs operate at different levels of efficiency and are offered at differing price points. The secret to lowering your energy costs is to consider the associated benefits of each, their application and then chose the light bulb that will offer the best long-term savings. We all know the standard incandescent light bulb. They are inexpensive to buy and produce a familiar, warm light which we compare all others to. But the outdated technology of the standard incandescent has many draw backs, the biggest being lifespan which means frequent replacement. Incandescent light bulbs also produce the most amount of heat, which in numbers and in the hot Las Vegas / Henderson NV climate can contribute higher costs to cool a home (more than most would expect). The only real benefit of incandescent lightbulbs are their availability in decorative bulb designs and compatibility with older style dimmers. New light bulb technology has been developed with the intent of improving upon the old standard. The most notable are the Light Emitting Diode (LED) and the Compact Fluorescent Lamp (CFL). Studies show that with the exception of retail cost, they outperform the Incandescent bulbs in every way. 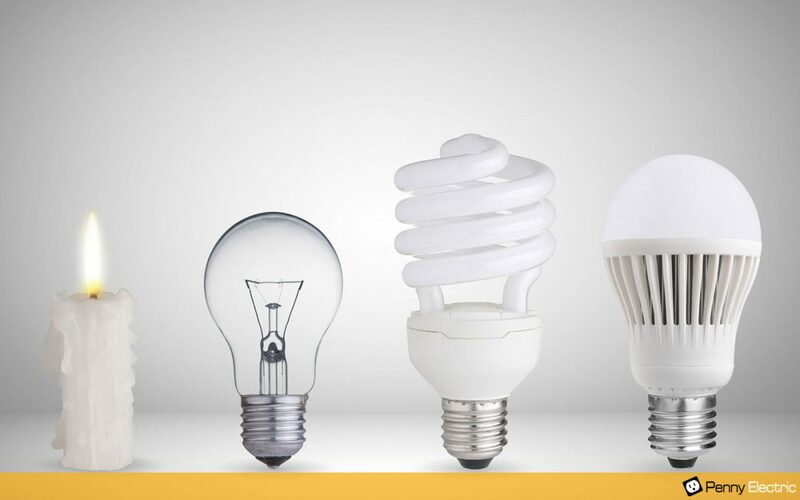 Despite many drawbacks in design, CFL light bulbs still come in 2nd place when it comes to lifespan and efficiency. They last eight times longer than Incandescent bulbs and produce 800 lumens using only 13 watts. They also cost less than half as much as LEDs, which may be appealing for short-term savings. The main problems of CFLs however is that they are not capable of much more of when it comes to cost and efficiency. CFLs also generate roughly 10x as much heat as LEDs, they require a ‘warm up’ period to reach full brightness, they are sensitive to humidity and low temperatures, they are no more durable than incandescents, they are an ecological nightmare (containing toxic Mercury) and yes, they do pose a fire risk at failure where they often smoke and omit a strong oder. LEDs light bulbs operate with the highest efficiency producing 800 lumens of light while using only 9.5 watts. According to the Greater Cincinnati Energy Alliance, LED light bulbs also have an average lifespan of 25,000 hours. By comparison, Incandescent bulbs have only a 1000-hour lifespan while using 60 watts to create the same amount of light. CO2 emissions of LEDs are 10% of incandescents and less than half of CFLs. LEDs are extremely durable, omit the least amount of heat and turn on to 100% brightness instantly. Initially the cost of LEDs made them prohibitive but since 2015 they have dropped dramatically in price, making them by far the best choice of the three. Currently the only significant drawback of LED light bulbs is their limited availability in accent lighting and that they typically require specialized dimmer switches not found in many homes. The final analysis of the GCEA study compared the running cost of these three light bulbs based on 25,000 hours of operation, factoring in a Kilowatt per hour rate of $0.11. An LED light bulb costs $36.13, the CFL costs $51.38, and the Incandescent costs $177.50. These figures truly show what the best choice is when it comes to long-term savings. If you make the investment of LED technology to light your home, your budget will see a noticeable and positive effect! For assistance or concerns on converting your home to LED lighting including upgrades to all switch components, including replacement of outdated dimming controls, give Penny Electric a call at 702-279-6040 or request a quote online 24x7.